Reflections takes its experimental platformer to new heights. People liked it enough that Ubisoft are bankrolling a sequel, Grow Up. 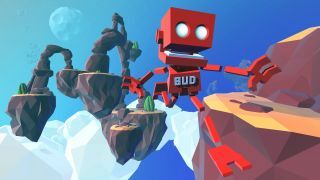 In the first game robot hero BUD had to grow and climb a massive star plant to reach a spaceship floating high above the atmosphere. It was all about going up, but now the action takes place across an entire planet. To make up for the vastly bigger—and higher—play space, BUD has a selection of new gadgets including a jet-powered glider and the ability to curl up into a ball to protect himself from fall damage. His weighty, physics-driven movement feels exactly the same as it did before, but these new tools make getting around much easier—and faster. Young wants you to feel more confident more quickly this time. “In Grow Home the early stages are about the tension of climbing,” he says. “But about halfway through you begin to feel like you’re mastering it, being braver when you take big jumps, grabbing things as you fall, using the jetpack. And we want to encourage more of that acrobatic style of play this time." Despite the planetary setting, it’s still ultimately a game about going up. The planet has its own star plants, the design of which depends on the particular biome you’re in. “You start off in a temperate zone. Then you might end up in the desert or tropical area next. In the temperate zone you can bounce on fungi growing on the star plant, while in the tropical zone there are dangling tendrils that fling you into the air when you grab them. This time BUD’s trying to reach a moon floating above the planet, which will involve growing those star plants again. “We needed to keep a simple, identifiable goal,” says Young. “In the first game it was reaching the ship, now it’s reaching the moon.” Along the way you can collect and catalogue the weird plants and flowers on the planet, some of which can be used to your advantage, like grabbing hold of them as they shoot into the air. I’m glad Reflections hasn’t tinkered with the basics of BUD’s movement much, because it was pretty much perfect to begin with. Instead, they’ve dramatically expanded his polygonal playground and given him more interesting ways to navigate it, which is all a sequel really needed. Grow Home is quietly one of the best 3D platformers on PC, and I’m delighted it’s getting a sequel. It’s clear it’s a passion project, and it’s great to see publishing giants like Ubisoft giving its developers the time and resources to make cool, weird stuff like it on the side.